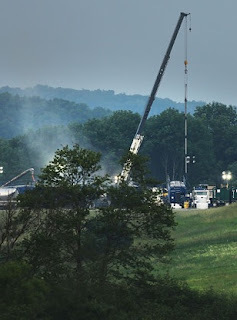 Reporting on hydraulic fracturing of deep shale for natural gas earned several reporters recognition in the 2012 Environmental Journalism Awards competition of the Society of Environmental Journalists. Other rural-oriented winners reported on other extractive industries, pesticide drift and patented seeds. Ten reporters at the Denton Record-Chronicle in Texas won the Kevin Carmody Award for in-depth reporting in a small market for “Citizens of the Shale,” a series that helped prompt the Texas legislature to requiring public disclosure of fracking chemicals and water use. Mike Soraghan of Energy & Environment News won third place in outstanding beat reporting in a large market for his stories in Greenwire and The New York Times on the shale drilling boom. The entries were "Baffled About Fracking? You’re Not Alone;" "Big Mac Is King in N.D. Energy Boom, but Other Businesses Struggle to Keep Up;" In Fish-Kill Mystery, EPA Scientist Points at Shale Drilling;" "Earthquakes Erode Support for Drilling, but They're Nothing New;" and What EPA Really Said About Wyo. Fracking Pollution." Second place in the small-market category went to Shauna Stephenson of the Wyoming Tribune Eagle for reporting on the Niobrara oil play; third place went to Clare Howard of 100 Reporters for "Downwind: Big ag at your door," about pesticide drift. First prize for outstanding beat reporting in a small market went to Matthew S. Frank of the Missoula Independent and High Country News; second place went to Sandra Hausman of WVTF, the public radio station at Virginia Tech, for a wide range of stories, including one on fracking. The Columbia Journalism Review's Curtis Brainard won third place for a series titled "Environmental Journalism Under Fire." For links to those entries, click here. In feature reporting, Paul Salopek won third place for “Closed-Source Crops” in Conservation magazine, which the judges called "a frightening and thought-provoking story that explores how multinational corporations have become the equivalent of the 'new seed oligarchy' in the agricultural world and how their practices and controls threaten biodiversity and food security." This category was won by Meera Subramanian for “India’s Vanishing Vultures” in the Virginia Quarterly Review. It "tells the story of an important but little-known ecological event, the sudden and rapid collapse of vulture populations in India in recent years." The story is here. 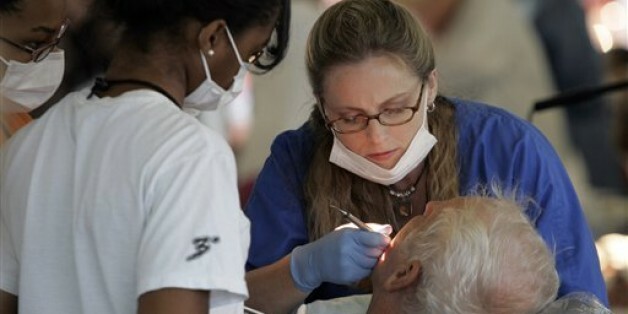 A dentist works at a Remote Area Medical Clinic in Wise, Va. Dental disease is the largest unmet health need in the U.S. among both children and adults, according to the Pew Children’s Dental Campaign. The worst-off are the poor, the young, the old, and those in rural America, reports Margot Sanger-Katz in the National Journal. Dental disease is among the most common reasons that children miss school. It’s the most common medical reason that soldiers can’t deploy. It is a leading cause of emergency-room visits in several states. For proponents of a freer health care market, who want patients to be motivated by financial incentives to shop around and avoid “unnecessary” care, the dental system offers a glimpse of how such a system might work. And research shows that poor oral health can lead to disease elsewhere in the body. In a world of medical priorities, dentistry takes a back seat to most, and In a world of health care, and rural America sometimes appears to not even be on the bus. The net result, writes Sanger-Katz, is that the United States faces a shortage of dentists that is particularly acute in poor, rural regions. "Huge pockets of the country have few (or no) providers. The federal government counts 4,503 mostly rural regions where more than 3,000 people share one dentist," she notes, "making it tough for many residents to find someone to fix their teeth." “It’s very much a free market, with a greater spread between the haves and have-nots,” said Burton Edelstein, a professor of dentistry at Columbia University and the founder of the Children’s Dental Health Project. "Dental insurance is much less widespread than medical insurance; 130 million Americans lacked dental coverage in 2009, but only 50 million lacked medical coverage," Sanger Katz-writes. "And with most payouts capped at $1,000 to $2,000 per year, insurance can’t cover much beyond basic services. Medicare does not pay for dental care at all, so 70 percent of seniors lack any dental coverage, according to an Institute of Medicine report. Medicaid also fails to provide meaningful dental access for many of its beneficiaries: The program pays dentists so poorly for treatment that only about 20 percent of them see Medicaid patients." Meanwhile, seven of 61 dental schools closed in the last 30 years, meaning 2,000 fewer dentists every year, a 33 percent drop in supply, just as an older generation of dentists started retiring. The result is a crisis. And, in a few lucky rural towns, the result looks like this: A mobile van outfitted with a volunteer dentist comes to a rural elementary school and offers free check-ups but no fillings. Or, better yet, a volunteer army of dentists, dental students and oral surgeons in a region volunteer for a two-day event at a vast arena where everyone is welcome to camp overnight for a place in line for care. Some of the dental expertise and hospitality is donated by Ronald McDonald House, or Remote Area Medical out of Knoxville, Tenn., or local community health centers. And while are limited in their ability to do much more than prevention, others can offer real dental care but no follow-up. The result is often a brutal kind of dentistry that involves, at best, mass extraction, some advice about what not to drink and explanations about how oral health is connected to overall health. Wind is a cash crop in rural Kansas counties, but will it slow population decline? 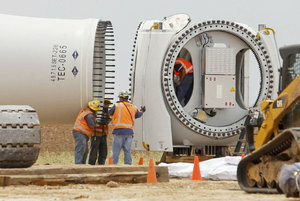 BP workers install a wind turbine blade. Wind farms provide a pretty strong spending spike during their almost year-long construction, but only a few jobs for local residents after construction. What they mainly provide thereafter is cash, in the form of lease payments to farmers and contributions to local governments. Which is, on measure, good financial news for rural Kansas communities, Dan Voorhis of The Wichita Eagle reports. Still, local officials fear it may do nothing to slow the depopulation of the region. Kansas Commerce Secretary Pat George is more optimistic. George said wind farms are one of the few categories of economic development that benefit rural parts of the state. "Anytime a project can pump a few million extra dollars a year into a small county, it will create an opportunity for good things – a restaurant, a gas station, a farm equipment dealer," George said. “With wind power under construction well north of a $1 billion this year, any time you can get that investment, especially in the rural counties, it helps." Voorhis writes that the Sunflower State is "the second windiest in the nation, but for a variety of reasons hasn’t taken full advantage of that with the construction of wind farms. At the end of 2011, it ranked 14th nationally in commercial wind power generation, according to the American Wind Energy Association. However, by the end of 2012, the state will more than double the amount of wind energy generated in Kansas to 2,660 megawatts from 21 wind farms across central and western Kansas and could break into the top 10 states." It is something, notes Voorhis, that Republican Gov. Sam Brownback has made one of the keystones of his economic platform, a position at odds with many others in his party. A coalition of 70 organizations keeps pressing Congress to include mandatory funding in the Farm Bill for rural development. The Daily Yonder notes, "Since 1996, Congress has included an average of $413 million in each Farm Bill for the Rural Development title." The top Democrat on the House Agriculture Committee predicted yesterday that that Farm Bill would see House floor action the week before the August recess, but several sources told Politico that it "is unlikely to see a floor vote," reporter Jake Sherman writes. "The committee’s product won’t see the light of day. Instead, Republicans are likely to try to extend the current farm policy that they’ve consistently decried as broken." Rep. Collin Peterson, D-Minn., said he and Agriculture Committee Chairman Frank Lucas, R-Okla., "would speak to [House Speaker John] Boehner about the bill in the coming days," reports Amanda Peterka of Environment & Energy News,(a subscription-only service). "He's a practical guy. He's a friend of mine," Peterson said of Boehner. "Next week I'll go over and see him. We'll have a little talk. I think at the end, I'm predicting ... the last week before we leave, this will be on the floor." Boehner's office has said the floor schedule is controlled by Majority Leader Eric Cantor, who is allied with more conservative members seeking bigger cuts in food stamps, which account for about 80 percent of the bill's spending. "GOP leaders are worried about a messy floor fight over divisive regional policies months before voters head to the ballot boxes," Sherman writes. "Odd couples could abound: The far left and far right would likely vote against the bill on the floor, the former thinking the bill cuts too much from food stamps, the latter insisting cuts aren’t deep enough. There’s also division over how much the government should be subsidizing the farm industry and whether it should control commodity prices. Arguing complex farm policy on the House floor in this political climate gives many Republican members pause. If the House can’t pass a bill, then it would go into negotiations with the Senate with a weak negotiating stance." Sherman's colleague David Rogers writes, "The timing is crucial if the House and Senate Agriculture Committees are to have any hope of negotiating a final package before the current farm program expires Sept. 30," David Rogers reports for Politico. Sen. Pat Roberts, R-Kan., told him, "We're not sure we could get the votes for an extension." Rogers writes, "The House floor debate could indeed be messy, but to do nothing would mean walking away from farm states months before the November elections." There were more signs yesterday of a fractious floor debate, as two Democrats who withdrew major amendments on energy and conservation during committee markup of the bill said they would keep pressing their cases. 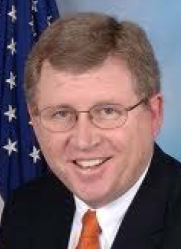 Rep.Leonard Boswell of Iowa "pledged to continue fighting for mandatory funding" for programs that "help rural landowners make energy efficiency improvements, fund renewable energy projects and plant biofuel crops," Peterka reports. "At the markup, Boswell withdrew the amendment after committee leaders promised to work with him on the issue." Rep. Tim Walz of Minnesota "said he plans to continue working on adding a provision to the bill that limits crop insurance subsidies on newly tilled land" nationwide, not just in the Prairie Pothole region, Peterka reports. Walz said he withdrew the amendment because he was afraid of disrupting the 'fragile coalition' that [Chairman Frank] Lucas put together to move the provision forward on a regional basis. 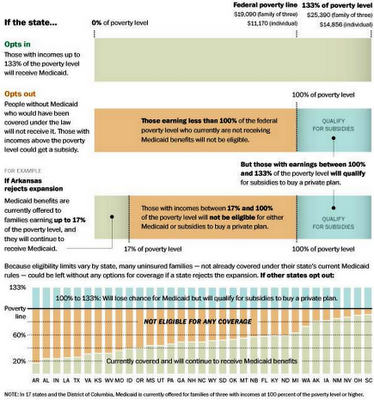 There is hesitation among governors on both sides of the aisle regarding whether or not to expand Medicaid, which would cover millions more Americans under the program for the poor and disabled. "At least seven Democratic governors have been noncommittal about their willingness to go along," N.C. Aizenman and Karen Tumulty report for The Washington Post. States would have to start paying part of the extra cost in 2017, rising to 10 percent by 2020. Several Republican governors have said they will not participate, while others say they have not decided. The issue is surely a major discussion topic at the National Governors Association meeting this week in Williamsburg, Va. Questions remain unanswered: "Will states that opt in have the option of scaling back in future years? 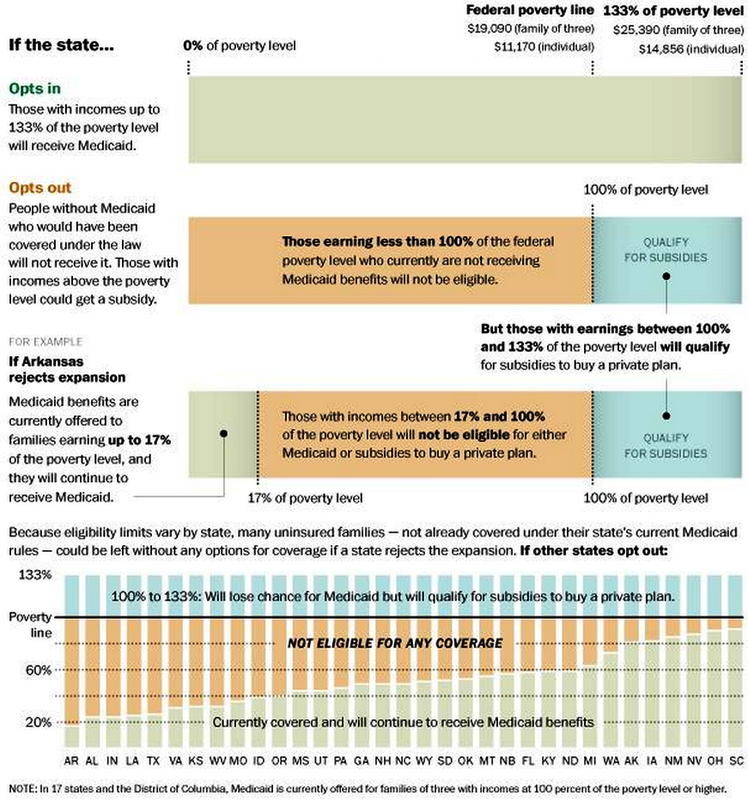 If a state that opts out decides it wants to participate at some later point, will the federal government still pay nearly the full cost of covering those who become newly eligible for Medicaid? And can a state participate only partially — for instance, by raising the income cutoff for its program to a level lower than the ceiling envisioned in the law, which is set at 133 percent of the federal poverty line?" Aisenman and Tumulty ask. NGA Executive Director Dan Crippen said states are confused over what to do. The association has sent a list of questions to Secretary of Health and Human Services Kathleen Sebelius about the issue. "States need to be making these decisions now, and it's hard to make them if you don't have clarity," said Matt Salo, director of the National Association of Medicaid Directors. Natural gas is still booming in several areas of the country, inciting heated debate about the practice of hydraulic fracturing and the safety of groundwater in communities where gas is extracted. A new report shows that regulations placed on this industry vary widely from state to state. 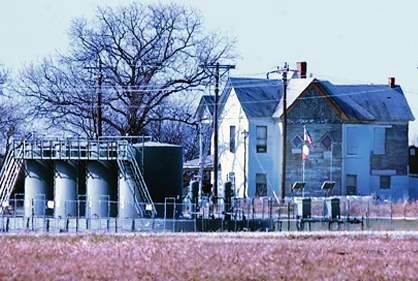 Some findings in the report: Drillers in Texas can dump oil and gas wastewater into unlined pits, while California bans such pits and requires the fluid to be stored in tanks. 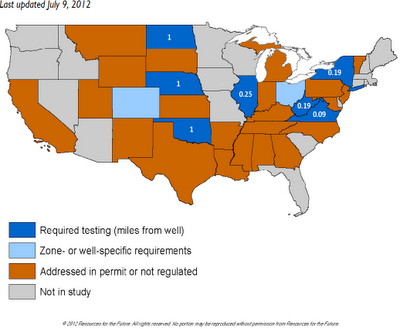 Ohio has no statewide requirement to report accidents and spills, and New Mexico has the fewest inspectors per well. Researchers from Resources for the Future, an environmental think tank, looked at regulations in gas-producing states and created maps like the one above "showing the different state policies on issues like wastewater, enforcement and well construction standards," Energy & Environment News reports. To see all the maps, click here. The researchers are trying to determine whether the differences are based on factors including geology and population density or institutional factors, such as the makeup of governments. "The effort could introduce more facts to a long-standing argument over the effectiveness of state regulation of oil and gas," E&E News reports. While environmental groups want drillers regulated by federal law, "The oil and gas industry prefers dealing with individual states rather than the federal Environmental Protection Agency," because state agencies aren't charged with "exclusively protecting human health and the environment." The worst Midwest drought in 25 years is damaging crops more than previously estimated, forcing the federal government to lower the estimate for what was expected to be a record harvest. The Department of Agriculture said the corn crop will average 146 bushels an acre, a 20-bushel drop from last month's estimate, and the biggest drop since the drought of 1988. "Agricultural economists said their main concern was the U.S. drought as the corn and soya crops enter their critical development phase," Emiko Terazono and Javier Blas of The Financial Times report. 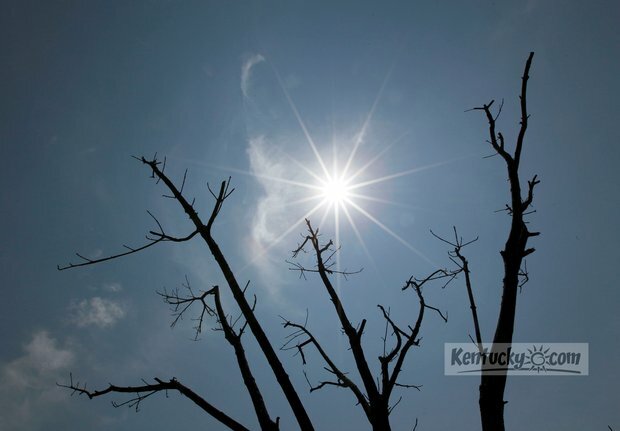 The USDA said in its report about the estimates that "the drop reflects sharply declining crop conditions resulting from limited rainfall since early April, coupled with excessive heat across much of the producing area in late June and early July." The House Agriculture Committee approved its version of the 2012 Farm Bill about 1a.m. today. The bill would provide farmers with a new form of crop insurance and cut about 2 percent in spending from food stamps, officially the Supplemental Nutrition and Assistance Program. The approval comes just three weeks after the Senate approved its version of the bill. Its prospects in the full House are uncertain; the current farm law expires in September. An amendment repealing the Grain Inspection, Packers and Stockyard Administration provisions in the 2008 law, which were meant to protect small farmers by forcing new rules on meat and poultry buyers, was approved, Erik Wasson of The Hill reports. Approval of the bill is seen as a major victory for Committee Chairman Frank Lucas and ranking member Collin Peterson, left, "who had risked angering factions in their own parties to forge a compromise bill," Wasson writes. Lucas has said he will now immediately push for a full House floor vote, but his party leaders appear uncertain because of pressure from their right wing for more cuts in the food-stamp program. The bill is estimated to save $35 billion over 10 years, mostly through major changes in commodity programs and cuts to food stamps, which are about 80 percent of its spending, David Rogers of Politico reports. Direct cash subsidies would end and be replaced by a new form of crop insurance, but target prices as a safety net, which are important to Southern farmers, would be kept. Five Democrats joined Republicans in a 31-15 vote upholding $16.5 billion savings over 10 years from food stamps. In a "pivotal" move, Rogers writes, Alabama Republican Martha Roby's amendment tightening procedures for verifying the legal status of immigrants receiving food stamps was upheld. The strong bipartisan vote puts more pressure on House Republican leaders to give the bill a floor vote before the August recess, Rogers writes: "Seldom has a major bill moved so far in Congress with so little attention. But defying its doubters, it can no longer be ignored politically — with Iowa in play in the presidential election and the current farm program expiring Sept. 30." In an effort to stem the tide of OxyContin addiction in the country's rural regions, its creator, Purdue Pharma, changed the formula to make the opioid pill harder to crush and abuse, but this has caused "an unexpected, and dangerous, shift to heroin," a new study concludes, reports Alex Crees of Fox News. Researchers in the medical school at Washington University in St. Louis surveyed more than 2,500 patients from 150 drug treatment centers across the U.S. The number of people who reported OxyContin as their primarily abused drug dropped from 35.6 percent before the formula change to 12.8 percent afterward. But many are simply turning to heroin or other, stronger opioids. Researcher Theodore Cicero said heroin is similar to OxyContin and this is likely the biggest reason for turning to street drug. He said heroin is also cheap and readily available. The Humane Society of the United States plans to sue 51 pork producers in North Carolina, Iowa and Oklahoma for alleged unreported ammonia releases. The organization said it identified the producers "after months of research," and said they release hundreds of pounds of ammonia each day. The research methods used to determine this were not revealed. 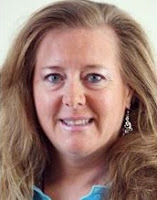 The death of a community newspaper reporter in Virginia is being investigating by local authorities and the Federal Bureau of Investigation as a homicide, reports Melissa Boughton of the Winchester Star. The paper's Sarah Greenhalgh, right, was found dead in a bedroom after her rented home in Upperville was burned, according to a press release from the Fauquier County Sheriff's Office. 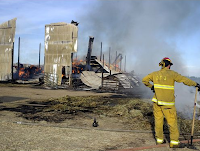 Authorities on the scene called the fire "suspicious," Boughton reports, but Lt. James Hartman would not reveal what evidence led to this conclusion. He also would not say whether Greenhalgh was killed from injuries sustained in the fire. Authorities have preliminary autopsy results, but won't release them because they fear it will jeopardize the case. Greenhalgh had worked on an investigative story that Hartman told the paper included several "persons of interest," with whom police are speaking. Authorities have seized her cell phone, personal computer, work computer and several work files. But the motive could be personal, not professional. 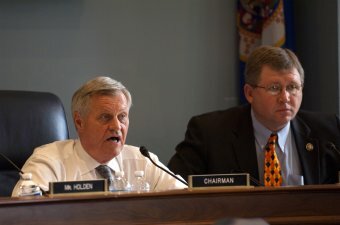 The House Agriculture Committee plowed through its version of the Farm Bill today as Chairman Frank Lucas, R-Okla., right, pushed to bring the bill to the full House before the August recess and not delay action until a "lame duck" session after the Nov. 8 election. Despite Peterson's partisan comments, his partnership with Lucas in writing a bill for committee consideration "appeared decisive thus far," reports David Rogers of Politico. "A ticklish political situation over an amendment by Rep. Martha Roby (R-Ala.) to verify the legal status of immigrants receiving food stamp benefits was resolved peacefully. And five Democrats including Peterson joined Republicans on a pivotal 31-15 vote upholding $16.5 billion savings over 10 years from the program." The bill "has caused intraparty tensions to flare up among both Democrats and Republicans, who are primarily squabbling over how much money should be allotted for food stamps," notes Daniel Newhauser of Roll Call. Liberal Democrats have railed against the cuts. The Senate has passed its own bill, and there is a possibility that House leaders could avoid a floor vote and go straight to House-Senate negotiations. An American Legion post in a small Connecticut community has renovated its building to house 15 homeless veterans, reports the radio outlet of the Connecticut Public Broadcasting Network. Navy vet William Czmyr, had the idea. Jewett City, population about 3,000, is "a rural town that lost its major textile industry when the mills closed after World War II. It's a quiet community with a Main Street that's quintessential New England," Lucy Nalpathanchil reports for WNPR and National Public Radio. The Department of Veterans Affairs is in the third year of an initiative to end homelessness, but the biggest challenge remains in rural communities where the VA has had a hard time connecting with veterans, Nalpathanchil reports. "For example, it could take a veteran in Jewett City more than an hour to get to one of Connecticut's two VA hospitals." Laurie Harkness, director of the VA's Errera Center in Connecticut, "says Jewett City could be a model for other communities," Nalpathanchil reports. "She says ideas like this come up all the time, but this rural town has something not found in very many places." She told WNPR, "This is the first project that I've ever been involved in where there was no 'not in my backyard.' Everybody supported it." Some of the weather extremes recently witnessed around the world have become far more likely because of human-induced global warming, researchers reported Tuesday. Justin Gillis reports in The New York Times that a new study found "that global warming made the severe heat wave that afflicted Texas last year 20 times as likely as it would have been in the 1960s. The extremely warm temperatures in Britain last November were 62 times as likely because of global warming," the report found. The findings, writes Gillis, "especially the specific numbers attached to some extreme events, represent an increased effort by scientists to respond to a public clamor for information about what is happening to the earth’s climate. 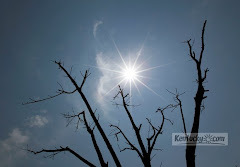 Studies seeking to discern any human influence on weather extremes have usually taken years, but in this case, researchers around the world managed to study six events from 2011 and publish the results in six months." The study was released along with a broader report on the state of the world’s climate. Both are to be published soon in the Bulletin of the American Meteorological Society. Gillis, The Times' environmental reporter, meanwhile, is among the targets of The American Tradition Institute (ATI), a conservative group that is using public records requests to publicize emails between reporters and climate scientists to suggest "collusion" between the media and environmental establishments, reports Greenwire (behind a pay wall, but a free trial can obtained by clicking here). "Multiple surveys of credentialed climate scientists show at least 96 to 98 percent agreement with these fundamentals," the scientists write, They note that the National Academy of Sciences has published a position statement affirming the fundamentals of human-induced climate change, as have over 100 other scientific societies, including the academies of all major democracies and the American Meteorological Society. The National Aeronautics and Space Administration (NASA), the National Oceanic and Atmospheric Administration (NOAA) and many other federal departments and agencies have been studying climate change for years. An international, interdisciplinary collection of thousands of expert scientists has summarized the evidence for the central role of human activities in causing climate change, in reports of the Intergovernmental Panel on Climate Change. Ohio Gov. John Kasich issued an executive order that immediately imposes new state regulations on deep injection wells used to dispose of chemically laced wastewater from oil and gas drilling. The Associated Press reports that the directive gives the Ohio Department of Natural Resources temporary authority to implement a list of rules announced after a series of Youngstown-area earthquakes was tied to one such well. The official order says the regulations will provide citizen protection possible without causing irreparable harm to an important industry. Under the order, the chief of the state Division of Oil and Gas Resources Management will have authority to order preliminary tests at proposed well sites, prevent drilling where tests fail, and limit injection pressure. The state also can order installation of automatic shutoff valves and monitor for leakage. The order will not affect a moratorium Kasich placed on deep injection wells surrounding the epicenter of the quakes. The order is effective for 90 days. Government laboratory results have confirmed what miners in small Appalachian towns and remote hollows already know to be true: Black lung is back. The disease's resurgence represents the the federal government's failure to deliver on its 40-year-old pledge to miners, but there is plenty of blame to go around, according to an investigation by the Center for Public Integrity, National Public Radio and Ken Ward Jr. of The Charleston Gazette. 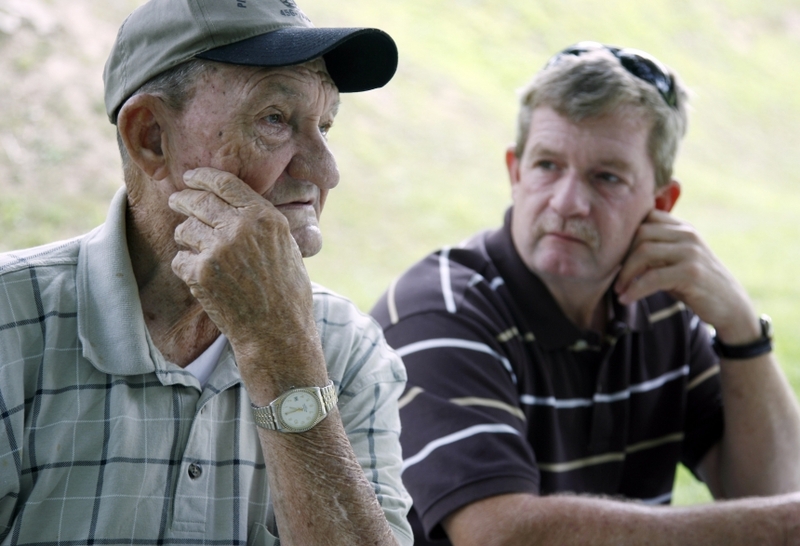 The multi-part package revealed results that are disheartening even to those already familiar with the work, life and politics of the Central Appalachian coalfield. The report finds that the system set up "for monitoring dust levels is tailor-made for cheating, and mining companies haven’t been shy about doing so. Meanwhile, regulators often have neglected to enforce even these porous rules. Again and again, attempts at reform have failed." The in-depth series looks at the failure of institutions, governmental agencies and mining companies to protect the miner, and some miners' own shortcomings. It quotes doctors who believed that, decades after the disease was first detected, it would have no longer exist because of tighter controls and safer standards. Howard Berkes of NPR and Chris Hamby of CPI talked to miners who must endure a tortuous regimen to breathe and feel betrayed by a system that demonstrated little proof that it wished to protect them from what it knew to be dangerous. CPI's analysis of data from the federal Mine Safety and Health Administration "found that miners have been breathing too much dust for years, but MSHA has issued relatively few violations and routinely allowed companies extra time to fix problems. MSHA chief Joe Main issued a statement in response to the findings: 'The current rules have been in effect for decades, do not adequately protect miners from disease and are in need of reform. That is why MSHA has proposed several changes to overhaul the current standards and reduce miners' exposure to unhealthy dust.' Similar attempts at reform have died twice before." In the mid-1990s, medical experts began noticing an increase in black-lung diagnoses, including among younger miners and a more rapid progression to severe stages of sickness. The trend is most acute in a triangular region of Appalachia that includes Eastern Kentucky, southern West Virginia and southwest Virginia. 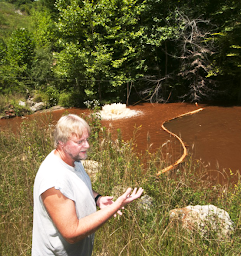 "Since [federal regulators] started protecting us ... 70,000 of us have died," says Mark McCowan, a 47-year-old former coal miner from Pounding Mill, Va., who worked 21 years underground. McCowan suffers from progressive massive fibrosis, the worst stage of the disease, and says, "I don't feel very protected." The National Mining Association, the main trade group representing mining companies, disputes some of the government's data and the analysis, but agrees that black lung’s resurgence is a problem in need of attention. To the association, however, it is primarily a regional phenomenon of Central Appalachia — one that doesn’t justify new national rules. Woody Guthrie's 100th birthday is Saturday; how about singing 'This Land Is Your Land' to mark it? 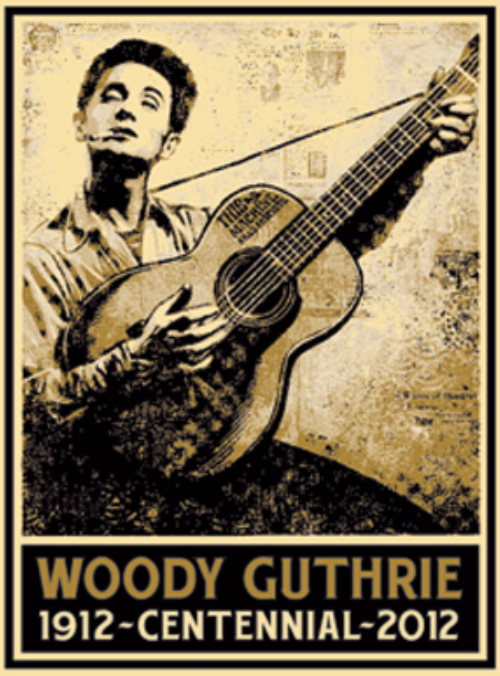 The 15th annual Woody Guthrie Folk Festival opens tomorrow in the singer-songwriter's hometown of Okemah, Okla., and it will be a special one, running through the 100th anniversary of his birth on Saturday, July 14. The Woody Guthrie Centennial website says, "His songs have run around the world like a fast train on a well oiled track. They've become the folk song standards of the nation, known and performed in many languages throughout the world. Pretty Boy Floyd, Pastures of Plenty, Hard Travelin', Deportees, Roll On Columbia, Vigilante Man and This Land Is Your Land are among the hundreds of his songs that have become staples in the canon of American music." You know what I'd like to hear on Saturday? The crowd at a Major League Baseball park singing "this Land is Your Land," which is an aspirational anthem, not a celebratory one, as "The Star-Spangled Banner" is. We need to celebrate, but we also need to be a nation of shared aspirations. "This Land" would be especially appropriate at Yankee Stadium, next to "the New York island," and in the city where Guthrie, who died in 1967, lived longest. But it sounds good anywhere. Sing it on Saturday! 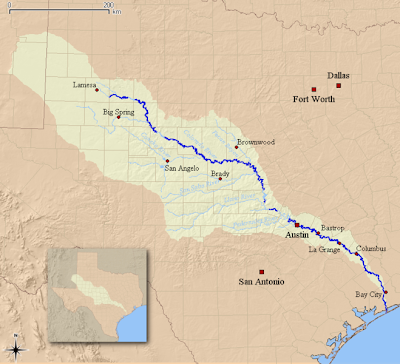 Austin-based LCRA is the "chief arbiter" of who gets water and who doesn't, and the move to cut off water for downstream farmers was perhaps an inevitable move, Price reports. If the drought continues into 2013, those farmers could be cut off again. LCRA adopted stricter guidelines this February that reduces the amount of water released to farmers while almost doubling the amount for cities and power plants. Duke University and California State Polytechnic University researchers tested drinking-water wells and aquifers in northeastern Pennsylvania and found that water had mixed with brine that closely matches brine found in the Marcellus Shale in some samples. No drilling chemicals were found in the samples, and there was no correlation between where the natural brine was found and where drilling occurs. But, Lustgarten notes, its presence and finding that it had moved over thousands of vertical feet "contradicts the oft-repeated notion that deeply buried rock layers will always seal in material injected underground through drilling, mining or underground disposal." While members of the U.S. House begin debate about whether or not to cut funding for the Supplemental Nutrition Assistance Program (food stamps) as part of its version of the 2012 Farm Bill, at least one large and powerful group has a vested interest in its continued growth: corporations that make or sell junk food. Brad Tuttle of Time reports that corporations including Pepsi, Kraft Foods, Coca-Cola and the Corn Refiners of America are likely most interested in continued expansion of SNAP because all have lobbied Congress and/or various states to make sure SNAP recipients have full freedom to decide how to spend SNAP money, including unlimited purchase of soda and junk food. "The idea that the food stamp program is essentially a corporate subsidy sounds like it could have been cooked up by the Tea Party or a libertarian, anti-tax group. But this argument has lately coming from very different quarters," Tuttle reports. Michelle Simon, a public-health expert and leader of watchdog group Eat Drink Politics, has said "SNAP represents the largest, most overlooked corporate subsidy" in the 2012 Farm Bill. She concluded last month in a report that big bank J.P. Morgan Chase benefits from SNAP just as much as big food corporations because it gets tens of millions a year from states in exchange for operating SNAP electronic benefits transfer cards. New York University nutrition professor Marion Nestle told the San Francisco Chronicle that it's "time to consider the idea of limits" for SNAP recipients. USA Today's editorial board has also condemned the growth of SNAP as being politically motivated. The White House Business, the Delta Regional Authority, the Appalachian Regional Commission and the Small Business Administration will host a rural economic forum this Thursday at the University of Mississippi in Oxford to encourage entrepreneurship, innovation and job creation in rural areas. A White House press release says, "Officials will discuss the Obama administration's support for policies that grow our economy by harnessing the potential of entrepreneurs and small business owners in rural communities." The Oxford forum is the eighth in a series connecting entrepreneurs and business owners to resources and networks that could help them succeed. The event is open to pre-credentialed news media, and interested media must RSVP by July 11 at 6 p.m. The forum will also be streamed live and can be followed on Twitter at #RuralEconForum. Corn in the legume-based, left, and conventional plots six weeks after planting during the 1995 drought. The conventional corn is showing signs of water stress. As the Midwestern drought has hung on and more states are reporting damage to their impending corn crop, Tom Philpott of Mother Jones reflected on a recent Nature study that found that industrial agricultural methods were found to produce higher yields than farms that used organic methods. (He notes he was not convinced by the study but he continues on that, in any case, "under conditions of extreme weather, things absolutely change. "Soils managed with organic methods have shown better water-holding capacity and water infiltration rates and have produced higher yields than conventional systems under drought conditions and excessive rainfall," Philpott reports. In other words, he explains, organically managed soils deal with water better -- both in conditions of drought and heavy storms, the frequency of which is also expected to increase as the climate changes. Soil rich in organic matter -- well-decayed remnants of plants and other living creatures -- bolster soil in weather extremes by helping store water in times of scarcity and by holding together and not eroding away during heavy rains. 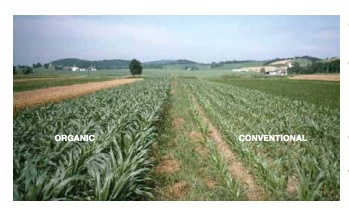 And why would organically managed soils contain more organic matter? It quite likely, Philpott writes, that this has to do "with the ways conventional and organic farmers feed the soil. If you're a conventional farmer, you probably fertilize annually with synthetic nitrogen fertilizer in the form of anhydrous ammonia. This is isolated plant food, free of any organic matter. (It's the equivalent of taking a vitamin pill—pure nutrients without actual food.) The only organic matter your soil gets comes from the crop residues that you leave in your field. This brings the advantage of convenience—crop nutrients come from tanks that can efficiently be sprayed on to fields. And it also gives crops a quick jot of ready-to-use nitrogen. If you're an organic farmer, you don't have the luxury of blasting your soil with straight nitrogen. To replenish nutrients, you have to have physical stuff that contains nitrogen bound up in organic matter—think compost and manure. You can also grow legume cover crops that trap nitrogen from the air and deliver it to the roots of plants in a form that can be taken into the soil. In this case, too, you're adding a nice dose of organic matter along with nitrogen, in the form of the plants that rot in the ground when the cover crops does. And, like conventional farmers, you get the benefit of crop residues left in the field. As a result of these difference, organically managed soils trap more carbon in the soil—and all of that carbon allows these soils to hold in water and nutrients better. (Note that carbon stored in soil in a stable fashion is carbon that isn't in the atmosphere trapping heat and causing the planet to warm. So organically managed soils don't just help farmers adapt to climate change—they also help help mitigate climate change.)" The oldest U.S. tests plots comparing organic and conventional farming, the Rodale Institute's fields in Pennsylvania, bear this out. (See the institute's latest report here.) In the latest report on its side-by-side experiment, which started 1981, Rodale found that "organic corn yields were 31 percent higher than conventional in years of drought." Researchers theorize that this is because the organic fields continue storing more carbon year after year, while the conventional ones have "shown a loss in carbon in more recent years." Another long-term study, Iowa State University's Long-Term Agroecological Research Experiment, found similar results. A week after a storm knocked out electricity across a lot of the country, Rebecca Hartman Huenink has plenty of sympathy for urban dwellers who lost air conditioning. But life in non-electrified rural America, she reports for the Daily Yonder, is a bit more complicated than that. 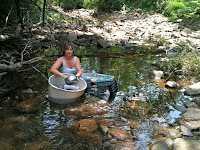 "That’s because in our part of the country, these days nearly everyone depends on a well for water. Modern wells depend on electric pumps. So, no power? No water. No water? No dish washing, no showers -- and no toilet. Think on that one for a minute." Huenink goes on: "No power? No gas pumps. No gas pumps? No going anywhere. When you live 15, 20, or even 30 miles from the nearest town, you can't just walk down the street and buy a quart of milk. Oh, and that quart of milk? Gone sour -- in the dumpster. The grocery store, 20 or 30 miles away, doesn't have power either. So no power? No food. None to buy, anyway. Speaking of food, people in the country rely on their freezers. Animals (deer, cattle, hogs) generally go in the freezer in the fall and feed the family for the rest of the year. No power? No freezer. No freezer? No meat. As my teenage neighbor pointed out, "If the meat in the freezer goes bad, we'll be very, very vegetarian until the next calf is grown." Huenink reminds that this is not a part of the world "where people tend to have paid time off for things like natural disasters. Most people work hourly jobs that don't pay you if you don't show up, or they run small-to-tiny farms and businesses that stand to lose big or even fold in the face of a week or more without water or transportation." Now, writes Huenink, people are talking about self-sufficiency, "neighbors wondering about wind (or solar) powered well pumps, Facebook friends swearing to ask their grandmothers to teach them to can." Meanwhile, West Virginians are used to finding a way to get by, she writes, all the while, remembering that their coal miners are the ones who keep the lights on for a lot of Americans and the awful irony that, because of terrain and remoteness, she will wait an inordinately long time for the power company to turn her electricity back on. UPDATE, July 27: A memorial service with tributes and Appalachian music will be held Saturday, Aug. 25 from 2 to 3 p.m. in the Calloway Peak room in the student union at Appalachian State. Howard Dorgan, whose studies of religion in Appalachia brought him many honors, died on July 5, his 80th birthday, at his home in Boone, N.C. Born in Ruston, La., he earned a Ph.D. in speech communication from Louisiana State University and in 1971 joined the Appalachian State University Department of Communication, where he remained until he retired in 2000. 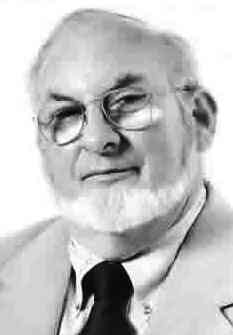 His work on Central Appalachian Baptist communities resulted in numerous books and awards, including the 1993 Thomas Wolfe Literary Award for Airwaves of Zion, his book about religious radio programming in the region. He edited the religious section of the Encyclopedia of Appalachia. Dorgan is survived by his wife, Kathleen, and two children. A memorial service will be held later at Appalachian State, where his papers are housed. Today's newspapers had three important stories about coal, each touching on one of the three main aspects that make it controversial: health and safety in underground mines; environmental damage from surface mines and old deep mines; and the technical obstacles that face carbon capture and sequestration, which could be key to cutting coal's contributions to climate change. Ken Ward Jr. of the Charleston Gazette and Chris Hamby of the Center for Public Integrity teamed up with NPR News to explain how the main disease of underground mining, black lung, has again become prevalent and why efforts against it have stalled. Today's stories are the start of a package that will continue Monday in the Gazette and on NPR. (Links updated) The stories are part part of "Hard Labor," an occasional series on health, safety and economic threats to U.S. workers. The International Society of Weekly Newspaper Editors concluded its annual conference last weekend at Western Washington University in Bellingham by giving one of its stalwarts the organization's top award and recognizing some of the best editorial writing in weeklies in 2011. 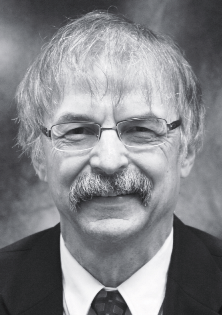 Tim Waltner, publisher of the Freeman Courier in South Dakota, won the Eugene Cervi Award, which honors an editor who has consistently acted in the conviction that good journalism begets good government, and for adhering to the highest standards of the craft. Waltner became editor of the Courier in 1977, and he bought it in 1984. 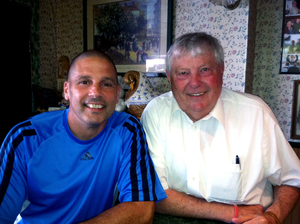 His son Jeremy is now editor, and both of them have been president of ISWNE. "I strongly believe that aggressive but fair news reporting and bold opinion writing are at the heart of the mission of a community newspaper," he said in response to the award, named for the late editor of the old Rocky Mountain Journal. Waltner is on the advisory board of the Institute for Rural Journalism and Community Issues, publisher of The Rural Blog. 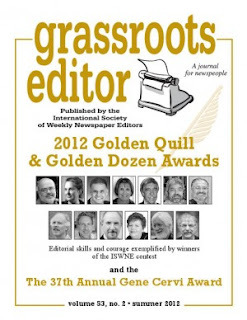 The Summer 2012 edition of Grassroots Editor, the organization's quarterly, has six tributes to Waltner and copies of every award-winning editorial in its annual Golden Quill editorial contest, in which a winner and a Golden Dozen are honored. This year's Golden Quill went to Vernon Oickle of the Lunenberg County Progress Bulletin of Nova Scotia, who "spent months digging into why and how the local school board failed to inform the public about its review process on potential school closures and ignored its duty to engage the public in discussion about the issue," the citation says. "It took months to get the relevant emails and the board wanted to charge hundreds of dollars for the records. The paper prevailed and did not have to pay for the information because the emails were of vital public interest. The outcome of Oickle’s battle was that the board was fired by the Department of Education. Additionally, the provincial legislature created additional powers for the minister of education to review and remove school boards." The quarterly has a full account from Oickle. The Golden Quill winners were Melissa Hale-Spencer of the Altamont Enterprise in New York; Paul MacNeill, publisher of the Eastern Graphic on Prince Edward Island; Missy Layfield of the Island Sand Paper in Fort Myers Beach, Fla.; Ross Connelly of The Hardwick Gazette in Vermont; Robert Trapp of the Rio Grande Sun in Española, N.M.; George Brown of the Ponoka News in Alberta; Peter Weinschenk of The Record-Review in Abbotsford, Wis.; Mo Mehlsak of The Forecaster in Falmouth, Maine; Jim Painter of the West Valley View in Avondale, Ariz.; Joan Plaxton of The Valleyview Valley News in Valleyview, Alberta; and David Giffey, former editor of the Home News in Spring Green, Wis.